I needed a new watchband. My inexpensive watch came with a wildly uncomfortable plastic strap. I hated it. However, I am just not good at changing watchbands. Those darned little pins are so small! Even when I succeed at getting them off, I can almost never get them back on. And half the time, I wind up shooting them across the room, where they disappear to never again be seen. So, I began a search for a one-piece watchband. I found a few, but they were all "sports" style bands with velcro fastenings, and just not very attractive. There was nothing that I could find which would allow my watch to look good when I wanted to wear it with business clothes or a nice outfit for an evening out. I felt frustrated, then I had an inspiration; what I needed was something that could be changed easily, which would look good with different color outfits, and that would be comfortable. I needed a scarf for my watch! I raided my scarf drawer and began cutting up an old scarf. It was far from perfect, but it worked. 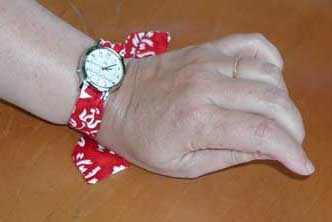 I sat down with a seamstress friend and together we designed a WatchScarf that fit what I wanted to wear myself. I chose fabric that got the other people in the fabric store to stop and buy some for themselves; then we made some samples. After wearing them around for a few weeks, I tinkered with the design to get the look and feel I wanted, and now I can present to you the finished product!